OVER the years, Castleford have become renowned for producing quality half-backs. Alan Hardisty, Keith Hepworth, Roger Millward and John Joyner are just a few. He has some way to go to reach the levels of that illustrious quartet but, if his first start is a hint, young Tom Holmes certainly has the look of a talented Castleford No 6. 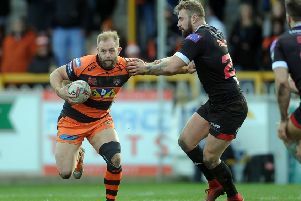 With some deft handling and sharp running, he impressed during injury-ravaged Tigers’ 38-34 success against Huddersfield Giants on Sunday. The 20-year-old hails from the nearby Lock Lane amateur club and said: “I really enjoyed the experience. “I’ve always been a Cas’ fan. I used to stand in the main stand over there cheering the lads on so it’s weird playing with and against the same players now. “(Tigers’ assistant) Danny Orr was one of the halves I looked up to so it’s great to be getting coached by him now. Holmes’s delayed pass sent Mike McMeeken over for his second try and he created space for his outside backs on numerous occasions, recovering well after a couple of early forward passes. “I was quite mad with those mistakes, but we built back into the game, got a few more tries and I felt more confident on the ball,” he added. “We made it hard for ourselves, but the fans were great as usual and I really enjoyed starting and getting the full game.